"I had been in New York for a long time, acting on TV and doing a little bit of theater. I had a long-running gig as sound engineer for an off-Broadway show, 'I Love You, You're Perfect, Now Change,' and once the show closed I wanted to see which direction my career should go in, thinking of what would shake things up the most. So, I came out here, and that's really shaken things up," actress Cathy Diane Tomlin tells of her decision to return to Los Angeles, the city where she was born and raised. Since moving back to California in 2009, Cathy has won roles in films such as Red Wing with Frances Fisher, Bill Paxton and Luke Perry, as well as several plays and television programs ("Grey's Anatomy," "Days of Our Lives"). We get together to talk about these roles and growing up, moving away and relocating back to Los Angeles at one of Cathy's favorite restaurants, Veggie Grill. Being a vegetarian, she loves the many menu options and the convenience the fast-casual, meat-free establishment offers. "There aren't a ton of vegetarian restaurants that I like in L.A. It's been hard for me to find that one place that I like a lot, but Veggie Grill is kind of it," she admits. "I live in South Los Angeles, but I tend to be in this area a lot – Beverly Hills, Studio City – to go to auditions, so I come here a lot." Cathy usually orders the All Hail Kale salad, which is marinated kale and cabbage topped with corn salsa, agave-roasted walnuts, quinoa and a ginger-papaya vinaigrette. She usually adds tempeh to the salad but opts for some Blackened Chickin' today. Veggie Grill is also known for its delicious "Bean Me Up" Chili, savory sweet potato Sweetheart Fries and spicy Buffalo Wings. Aside from veggie-steak tacos, sandwiches and wraps, there are several tempting desserts to be sampled. Cathy raves about the Carrot Cake, made with fresh carrots, walnuts and Veggie Grill cream cheese frosting, and I become smitten with the crunchy Chocolate Chip Cookies that are made in-house every day using organic flour, cane juice, walnuts and dark chocolate chips. 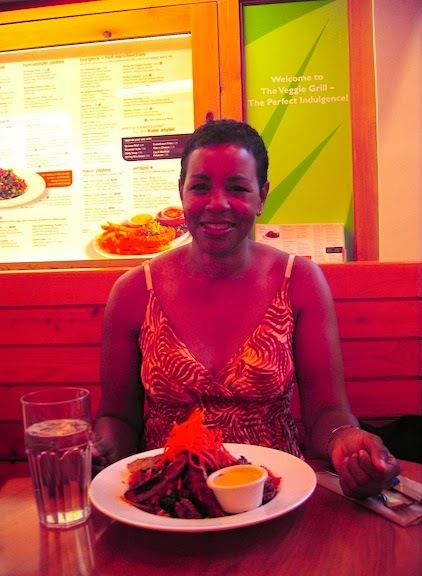 She came to love several vegetarian hot spots in New York while she acted in theater productions, Michael Clayton with George Clooney and daytime soap operas like 'As the World Turns" and "One Life to Live." She also became enamored with the city's public transportation system and eventually found herself embracing Los Angeles' too. "When I left, there was no real public transportation here, and when I first got back I didn't have a car, so I learned to love public transportation in Los Angeles," she remembers. "It sounds weird, but I felt a sense of freedom being on the bus or subway that you do have, but you don't, when you're in a car – you have to worry about parking, gas, insurance, maintenance, traffic. It was always great to sit on the train and read a book." Growing up in South Los Angeles, there was one place where you could always find Cathy, the movies. "I lived in the movie theater. Once I was able to go on my own in junior high, I would go with my friends. If there were three or four movies playing, I would somehow manage to sneak in to see a couple of them," she confesses with a smile. "I would spend hours and hours at the movies. That was really what I loved to do." Her passion for film continues to this day. While Cathy often unwinds by going on a picnic in one of Los Angeles' many parks, she laments that there aren't more free, outdoor movie screenings taking place around town. "Something I really loved in New York were outdoor movies. During the summer there were outdoor movies every day of the week in different locations, and there were all free. I had already seen a lot of the movies, but it was fun being outside under the stars, having a picnic and being among humanity. One of my favorites was in Bryant Park, which is near Times Square so there's the hustle and bustle of people going to and fro the theater and everything. On Monday nights at 5 p.m., everybody would start piling into the park to put out their blankets. It was a whole adventure," she recalls. "The only place I know of here is at the cemetery [Cinespia at Hollywood Forever], but there's something nice about a free movie and not having to worry about parking." Taking inspiration from all of the films she was consuming, Cathy started acting in junior high and honing her craft in classes. Theatre of Arts was one of those training places that gave her a good head start into what she's doing now, and it was during her time there that she gained a valuable piece of advice that she has kept with her to this day. "I had a teacher named Ruben Moreno who said, 'An audition is a performance.' So many people look at auditions like, 'Oh, it's just an audition. What if I don't even get the job?' But the way to get over that is to remember that this is what you love to do, you have three minutes to wow them and give them the best performance you possibly can," she informs. "Whether you get the job or not, you have to really put everything out there. That's what acting is all about, whether you have an audience of one person or a hundred people." Cathy continued performing in play productions in high school, and even though she obtained a degree in Mechanical Engineering (with Honors) from Tuskegee University and began a career in the field, she maintained a passion for acting. "I did productions during my freshman and sophomore years of college even though they didn't have a theater program. There was a drama teacher and one or two drama classes within the English department, and he would direct a couple of productions per year. I did as much as I could for as long as I could until my schedule took over and I couldn't anymore, but it never really left my mind," she says. "Once I got out of college and moved from Alabama to South Carolina to I start my engineering job, I was going home every day, watching TV and thought, 'What else is there to do? Theater – that's what I love to do.' I looked up the theaters in town and called the first one I found to find out when they were having auditions. That was the start of me getting back into performing, so there was just a small gap of time in college when I didn't do anything at all." Her love of math and science is something that she hopes to combine with her acting skills in a science-fiction or action film one day. "I would love to work with Ridley Scott, Steven Spielberg and J.J. Abrams. When I watch all the Star Trek movies or the new version of 'Battlestar Galactica' on television, I wonder, 'Why didn't they call me?' There is some real meat to them, gravitas of the storylines, and in general, that is the sort of work I want to do, whether it's science fiction or present-day drama," she tells. "I love science fiction, action and musicals, too. I'm not a singer or dancer, but there's something so wonderful about musicals. A lot of people who are more rooted in reality look at musicals and say, 'It's so unreal. They would never just start singing in the middle,' but there's something about the music, dancing and film put together that makes it really special. If I could do all that, it would be icing on the cake." Cathy is doing just fine focusing on the aspects of performing that she excels at, though. She is a member of L.A. theater companies like Theatre West, the Group Repertory Theatre and Theatre 40, acting in several of their plays. She is consistently auditioning and booking television and film jobs, and one of her most recent roles is in Will Wallace's Red Wing, a socially thought-provoking drama based on George Sand's novella Francois le Champ. In it, she portrays Isabelle Riley, the sickly foster parent of the film's hero, Francis (Austin Harrod and Glen Powell). I ask her if there was a specific process she went through in order prepare for the character. "I wanted to immerse myself in Texas culture and not really focus on where the impetus of the story came from [Sand's novella]. After the first audition, the director asked me, 'Could you grow your hair out a little bit? I don't want you to look so professional.' I replied, 'OK, I can do that,' and I think I have a tendency to work from the outside in. A lot of times it's about the wardrobe and the appearance; the character builds from there for me," she says. "That was very true for Isabelle. I focused on what she felt like on a day-to-day basis because she's the kind of person who doesn't really have a future; it's all about getting through today." As Cathy finishes her All Hail Kale salad, she tells me about her current role in a production at Theatre 40 in Beverly Hills, which is broadening her acting experience by adding more comedy to her repertoire. "Right now I'm in rehearsals for 'Light Up the Sky' by Moss Hart, and I have to say this is the most hysterical play that I've ever worked on. I tend to do dramas and haven't done a lot of comedies, but the actors in this play are are so comical," she begins. "My role in this play about theater is an observer because she's put into this world where she knows nothing. My character is a ghostwriter who is writing the autobiography of the main character, Irene Livingston, and all these other people are immersed in theater while she doesn't know that much about the craziness. She's sitting back going, 'What the heck have I gotten myself into?' It's so much fun to do; it's going to be a great show"
As Cathy continues to be cast in projects, she remains dedicated to the craft of acting, taking ongoing classes in technique with the likes of Will Wallace and Stuart K. Robinson. There is no question that when Scott, Spielberg or Abrams give her a call, she will be ready. "I''m very surprised at people who say, 'I'll try it for a couple of years and see what happens, see where my career goes.' The thing about acting is, you have to be in it for the long haul if you want to be successful," she says. "You have to keep at it for as long as you can, that's really what you have to do." See Cathy Diane Tomlin in "Light Up The Sky" Nov. 21-Dec. 22 at Theatre 40 in Beverly Hills. For more information, visit cathydianetomlin.net.